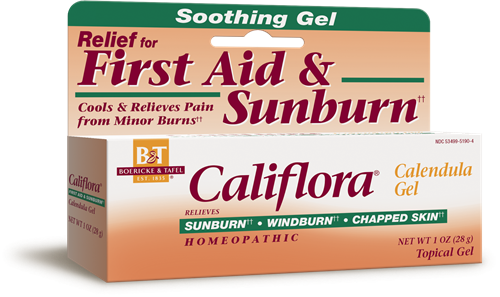 Califlora Calendula Gel / 1 oz - Nature's Way®. Calendula Topical Gel is clean, pleasant to use and non-greasy. For minor skin irritation, first wash with mild soap, rinse and dry. ethyl alcohol, polyacrylic acid, purified water, sodium hydroxide, witch hazel distillate. For external use only: Avoid contact with eyes. Do not use if hypersensitive to any ingredients in this product. Do not use on broken skin. Breast-feeding women should not apply to breast area. Ask a doctor before use in case of deep cuts or puncture wounds, animal bites or serious burns.